What good news the angels announced at the Savior’s birth! It’s definitely something to sing about! 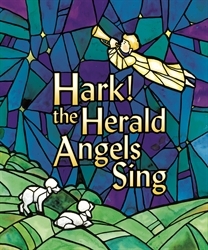 Three verses of this doctrinally rich hymn by Charles Wesley are enhanced by visuals of the Christmas story in a stained-glass format. The 8-page book in sturdy card stock includes the sheet music on the last page. Gr. 1–5.